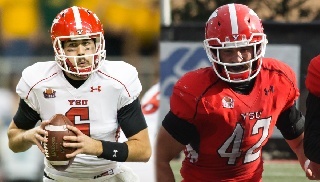 Youngstown State junior QB Hunter Wells and sophomore LB Armand Dellovade were named honorable-mention All-Missouri Valley Football Conference Academic selections, the league announced on Wednesday. Dellovade was a second-team all-league pick while Wells is 4-1 since taking over the starting quartrerback duties in late October. Dellovade has a 3.49 GPA while majoring in Business Management and Wells has a 3.63 GPA in Business.